A fire in Australia grew so powerful that it spawned a tornado nearly 500 metres wide, contributing to the destruction of more than 500 homes. The documentation of the tornado is said to be important because while columns of flame known as “fire whirls” have previously been observed, full-scale tornadoes caused by fire are less well-documented or understood. The fire in question hit Australia’s capital city, Canberra, on January 18th, 2003, when eyewitnesses reported seeing a tornado. To understand the event it is useful to know that Canberra’s western border is close to mountainous national park covered in native forest. The city’s outskirts were also home to several pine plantations. Some homes were fewer than 100 metres from those plantations. Fires started burning to the west of the city around January 9th and, thanks to the rugged terrain, went largely unchecked for some time. The fires gathered pace and strength before, on January 18th, a 40oC day with 60km/h winds saw them join and arrive in Canberra’s outer suburbs where they caused the loss of four lives and extensive property damage. Subsequent inquiries criticised emergency services’ inability to cope with a flood of information about the fires, plus deficiencies in equipment, as important contributors to the damage and loss of life. But a new paper, An Australian pyro-tornadogenesis event, asserts that authorities were not just up against a fire, but also a tornado caused by the fire. The tornado came about because large fires can produce thunderstorms, complete with lightning and all the trimmings. Sufficiently intense thunderstorms can produce tornados, and the paper says the storm of January 2003 had the power to do so. Both vehicles, the paper says, are rated to remain grounded in anything other than tornado-force winds. 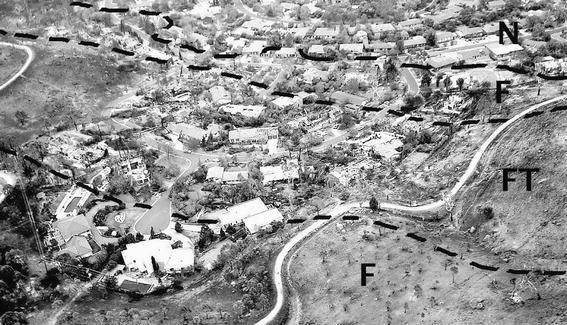 Another piece of evidence, depicted below, shows the difference in the intensity of damage between areas where the fire alone hit the suburb of Chapman, and where fire and the path of the tornado both arrived. The more intense damage in the section marked ‘FT’ is said to show the path of the tornado. fire and the fire tornado landed. The paper also includes photographs of the tornado, depicted in the montage below as images ‘d’, ‘e’ and ‘f’. Image ‘a’ shows the thunderhead, image ‘b’ depicts the path of the tornado and element ‘c’ shows damage to trees consistent with intense swirling winds. While the paper offers detailed meteorological analysis of the event, it includes few on-the-ground measurements of the tornado’s intensity. That’s to be expected given the severity of the event meant Canberrans had other things on their mind on the day. Such as survival and protection of their property.